Thanks to Lif for the great photo! 2013 was a pretty exceptional year for me, particularly as it concerns my writing. It was also a year where I learned a number of very interesting lessons. In July, I was contacted by a PR Rep who was interested in having a blog post of mine run in the October edition of her client’s magazine. In September, excited by the recent interest in my writing, I submitted an article to Strategic Finance, the monthly magazine of the Institute of Management Accountants (IMA), a professional association of which I’m a member. My article, Signaling Credibility, ran in the November edition. Being published this year wasn’t the product of me being a phenomenal writer. While I perhaps have better-than-average writing skills, I’m by no means an expert and there are undoubtedly countless writers (actual writers) out there that are far more talented than I am, with much more interesting things to say. Fortunately, what I’ve learned is that, being successful is rarely about being the best…it’s really most often about showing up (at least 80% of it – thanks Woody Allen). Being successful is often about the boring, extra ordinary actions that we take, consistently, that can lead to extraordinary results. For me, the extra ordinary actions of posting to my blog every so often and taking the time to simply email the editors of Strategic Finance lead to the extraordinary outcome of my content being published. The same simple action, an email, resulted in an article of mine being published on a very popular personal finance blog back in 2011. Then I remember that, nearly every day, for many years now, I’ve been seeking out blogs in order to learn about all kinds of topics. I’m sure those bloggers felt the same way when they were about to click ‘Publish.’ I’ve received all kinds of value from the reading that I’ve done online over the years, and from the comments I’ve been fortunate enough to receive on this site, I’m glad to know that readers from across the globe, even if it’s only a few dozen people, have found value in what I’ve written. What I need to remember is that, at any given moment, there is someone out there who is just like I was a few years back, with the same interests, the same questions and the same desire to learn. I’ve learned a lot over the past few years, learnings that I take for granted which might be entirely new to someone else. Here’s the lesson as I see it. Don’t underestimate yourself. You have something unique and valuable to offer the world and you shouldn’t hesitate to share it! So go ahead, make 2014 an extraordinary year…and don’t feel daunted, just focus on the extra ordinary things that you can do each and every day to reach your goals. Did you enjoy this post? If you did, please consider subscribing to my RSS Feed and sharing this post with your networks using the buttons below. It’s that time of year again…as the clock winds down on 2013, countless Americans are busy outlining the goals and resolutions that they plan to tackle in the New Year, just as soon as the ball drops in Times Square and just as soon as the calendar flips to January 2014…a fresh start. Much is written about resolutions this time of year, and while there are common themes throughout most of the commentary, such as the importance of SMART Goals (Specific / Measurable / Attainable / Relevant / Time-bound), much of the advice can be conflicting. Take Baby Steps. Dive Right In. Be Realistic. Be Unrealistic – Be Audacious. Make a Plan and Stick to It. Just Get Started, Perfect is the Enemy of the Good. Share Your Resolutions. Keep Your Resolutions Private. Focus on One Change at a Time. Commit – Make Big / Transformational Changes. To contribute to the confusion, when I think about New Year’s Resolutions, I embrace the polarity and borrow a bit from each side of the spectrum (conservative vs aggressive). For example, while I like to develop a clear plan around my resolutions (more conservative), I also like to pursue multiple changes at a time throughout the course of the year (more aggressive). The way I like to plan my resolutions enables me to pursue multiple changes in my life. Last year, at about this time, I was reading Rory Vaden’s ‘Take the Stairs’ and learned about his framework for setting resolutions…the ‘Fundamental Five’…and it really resonated with me. In rereading the chapter on this topic, I realized that he actually outlines six components of his framework, so I suppose ‘Sustaining Six’ might be a more accurate moniker. This will mean something different to everyone. It could mean reading daily from the Bible or attending mass on a weekly basis. It could also mean increasing your commitment to volunteering or charitable giving, be it for a faith-based organization or otherwise. What can you do this year to reconnect, or more deeply connect, with your faith? How can you give of your time or money to help others who are less fortunate than you? In a close second is family and friends. I think most of us would agree on the importance of this area of our lives, so I won’t spend much time arguing why it deserves a place among the ranks of your resolutions. What changes can you make in your life or what actions can you take to improve and strengthen the relationships with your family and closest friends? What can you do to build new relationships? This component can also focus more broadly on ‘health.’ It could mean taking a daily walk, going to the gym four times a week or improving your diet. It’s important to note the ranking of this component, third, before other, traditionally ‘important’ aspects of our lives such as our finances or our careers. While money will come and go throughout the year, largely based on success in our careers, we only have one body and it should be a priority to ensure we keep it strong and healthy for as long as possible. Taking an ‘airplane oxygen mask’ approach to life, you might even consider this component right alongside that of family and friends in importance. Just like with the oxygen masks on an airplane, we won’t be of any help to anyone else, in our families or in our jobs, if we don’t first take care of ourselves. If we want to be at our best, taking care of ourselves can’t always be what we first deprioritize. Money. It’s a common focus of New Year’s resolutions. Make more. Save more. You’ll note that I’ve included this ahead of ‘faculty’ and ‘fun.’ While it might make sense to have finances come before fun, after all, your financial house should be in order concerning the fundamentals before you begin focusing on the discretionary (fun money), placing this before ‘faculty (career)’ might be less intuitive. I’ve done so because, while it matters how much you earn, what really matters is how much you keep, which follows from the daily spending and saving decisions that you make. With that, the most impactful opportunity for improvement in this area is often to simply understand where your money is going and determining if that aligns with your values and priorities. Spend some time thinking about that before worrying about establishing a detailed budget or fretting about the allocation of your 401k…that can come later. Our jobs are important. For most of us, they are our primary source of income, and oftentimes – though not for all of us, they’re an important part of who we are. They also consume a significant portion of our time, often much more than 40 hours per week. Given how important our careers are to our personal and financial well-being, this is an important area of focus. Positive changes made in this area of our lives can help enable positive changes in the other areas of our lives. Focusing on improving our productivity at work can help us get home on time to be with our families and friends or can help us carve out time to exercise. Earning more can help improve our finances, which in turn can help our families and enable us to spend more on what matters to us. For some, positive change in this area might mean getting a new, better job. For others, positive change might mean focusing on learning more, reading about your industry or obtaining a certification relevant to your responsibilities (or the responsibilities that you’d like to have). While it is important to focus on improvement and making positive changes in our lives, it is also very important to take time to relax and to fully enjoy what makes us happy. This will have different meanings for each of us. Spending time on a long-held hobby, or picking up a new one. Learning a new skill. Reading. Writing. Traveling. What’s important is that we focus on what’s fun for us and that we make it a priority. Before signing off to enjoy my New Year’s Eve, a few words about prioritization. I alluded to this earlier when highlighting the differing opinions of starting small with one change at a time and thinking big, tackling transformational changes in our lives. For me, using this framework, I’ve had success in pursuing multiple changes in my life, across the different components of my life throughout the course of a year; however, not always in all areas at the same time. In ‘Taking the Stairs,’ Rory Vaden introduces the concept of ‘seasons’ and I think it is a helpful way to think about approaching change. Mainly, just as there are seasons throughout the year which bring about changes in the weather, there are seasons in our lives where the way we spend our time changes and our attention shifts. This might mean that, during a busy time at work when we are focused on ‘faculty,’ perhaps our focus on ‘fun’ or ‘fitness’ might temporarily be a lower priority. But what’s truly important is that while a ‘season’ might bring about a shift in focus, remember that, just like seasons in nature, it should be temporary and we should focus on finding a balance between all the areas of our life throughout the year. Do you make New Year’s resolutions? Do you focus on one big change or goal each year, or do you pursue a number of smaller changes and goals? Whenever you feel yourself tempted to say “I don’t have time” or “I’m too busy,” try using the phrase “It’s not a priority” and see how you feel. Often that is a perfectly adequate explanation. And sometimes it’s true even if it’s not politically correct. Other times, though, it turns out we’re just lying to ourselves. We do have time for what matters. Simple changes to the words we use can produce profound changes in the actions we take and the lives we lead. As an example, since college, until August of this year, I hadn’t set a foot inside the gym. Until I re-framed my words and thoughts in response to this quote from Laura Vanderkam, I’d regularly rationalize to myself that I wasn’t exercising because I didn’t have time or because I was always on the road for work. That’s much harder to say and it sure didn’t feel great to say…because it isn’t true! Being fit and healthy is a priority of mine. It never felt right to be living in a way that didn’t align with my values, but for some reason, saying it out loud was even worse. Since embracing this new way of thinking and speaking, miraculously, I’ve suddenly, somehow, managed to regularly make it to the gym, often 3 to 4 times per week. For me, changing the words I used was all that it took for me to change my actions. While there are still a few areas of my life where I make the “I don’t have time” excuse, mainly around my writing and volunteering (or lack thereof), these are my next targets for change, given how terrible it feels to say that “working on my writing isn’t a priority” or that “volunteering my time to help those who are less fortunate isn’t important.” Because it isn’t true. I don’t feel that way. But if you look at how I spend my time, my 168 hours, you’d easily be able to make that argument. Give it a try yourself, I think you’ll be pleasantly surprised with the results…and please let me know how it works out for you! Every morning on my way to work, I walk through Downtown Crossing toward South Station, and every morning, I encounter a significant number of homeless men and women who have spent the night outside. It’s heartbreaking. As the Financial District is waking, set to get busy with another work day, so to are these men and women, set to struggle through a tough day ahead. When I think of the challenges that I’ll encounter at work, or that I’ll encounter on any given day, knowing what they must live through puts everything (very quickly) into proper perspective. It certainly makes you thankful for a calendar full of meetings and tight client deadlines. That said, while I recognize their struggles and it pains me to see that such poverty is so prevalent in Boston, I’ll admit, I’ve never been particularly generous, in-person, to the homeless men and women that I encounter. While I occasionally support organizations that provide services to the poor and homeless, such as food banks and soup kitchens, I rarely give money directly to the men and women themselves. I don’t have any particularly strong reasoning as to why I don’t leave money, it isn’t that I’m against the practice, or think that it’s a ‘handout’ that will just be wasted on alcohol, cigarettes, or worse – drugs (though I must admit that thought does cross my mind at times). In fact, my education in economics leads me to feel that giving money directly to the homeless is the most efficient way to help them, avoiding the middleman and enabling them to maximize their utility however they see fit, even if I might disagree with how it is ultimately spent. Recently, I’ve been making a conscious effort to test my deeply ingrained habits, behaviors and assumptions. During this holiday season, I decided to test my habit of not giving directly to the homeless. Every morning, I walk past the same woman, and every morning, she greets everyone who passes by. She doesn’t ask for money, she just offers a simple ‘Good Morning’ and keeps an empty cup in her hand. I return her pleasantry with a quick ‘Good Morning’ as well, but quickly pass by on my walk to work. Last week, instead of simply passing by, I gave her a holiday greeting card that contained a Prepaid Visa Gift Card, a card that enables you to not only check the balance online, but also the transaction history. In the card, I wished her ‘Happy Holidays’ and told her to use the gift however she wanted, spending it on whatever would make her day a bit easier or more enjoyable. Over the past week, I’ve checked the balance of the card and have been pleased to find that she’s used all but $4.92, spending $13.37 at a CVS and $21.71 at a Tedeschi Food Shop. I have no idea what exactly she spent the money on, but I do know that, whatever it was, she chose it, and in so doing, hopefully chose items that were exactly what she needed and wanted at the time. While this experiment didn’t confirm or deny any stereotypes, or ‘prove’ anything necessarily, as she could very well have ‘wasted’ the gift, spending the money on junk food or cigarettes (alcohol isn’t available at either of the places she visited), but with holidays just recently behind us, I’m in an optimistic mood. Even if that is how she chose to spend the money, that’s fine by me. She has to deal with a lot just to get by everyday, so she’s in the best position to know what she needs and what makes her happy. Overall, the whole ‘experiment’ has just made me more curious about the ‘homeless problem.’ In particular, how did she end up in her position? Why does she choose to stay in the same location everyday? What does she do at the end of the day? Why was one of the gift card transactions made in Revere, MA when she spends (to my knowledge) all od her weekdays in Downtown Boston? In 2013, to (hopefully) answer some of my questions concerning the ‘homeless problem’ in Boston, I plan to engage with the homeless community through volunteer work, to hear their stories, to get beyond the superficial stereotypes (hopefully disproving them) and to hopefully further test my assumptions. If nothing else, this holiday ‘giving experiment’ has made me more conscious of how fortunate I am, reminded me of the importance of being mindful of that fact every day and encouraging me, as a result, to live my life in a more charitable way. Emmott Lennon, my grandfather (affectionately called ‘Grandpa Mutt’), passed away on September 29th. He was a good man, and as one small way to preserve his memory, I wanted to document and share the words that I offered at his burial on October 13th. I know that Grandpa Mutt didn’t want much ‘fuss’ made over his passing, in fact, he never really wanted much attention focused on him, so I’ll keep my remarks brief. While there is much that I could say this morning in honor and memory of Grandpa Mutt, I would like to expand on one thought in particular, a thought that has been on my mind the past few weeks. As a newlywed, as you might expect, I’ve been thinking a lot about marriage recently. Specifically, I’ve been thinking about the vows that we make on our wedding day. When I reflect on this, I’m reminded that while we say these vows on one day of our lives, we need to live them each and every day of our lives. For me, there are few better examples of living your vows than Grandpa Mutt. With his words, he may not have been the most outwardly emotional man, but his actions spoke far louder than his words ever could. He truly and fully lived his vows, until the very end. He lived his vows by visiting his wife every day over the past decade, without fail, as Alzheimer’s continued to take its toll on her mind and body, talking to her, telling her stories and singing to her, even when she may have no longer known just exactly who he was. – And that is an inspiration and a model that I, and all those who are married, should aspire to in their own lives. Thank you Grandpa Mutt for being an inspiration and for being a role model for all of us in this regard. You’ll be sorely missed. God bless. Rest in peace. We love you. Every Sunday, as part of our weekly routine of chores, Erica (my fiancée) and I go to the same corner laundromat in our neighborhood. 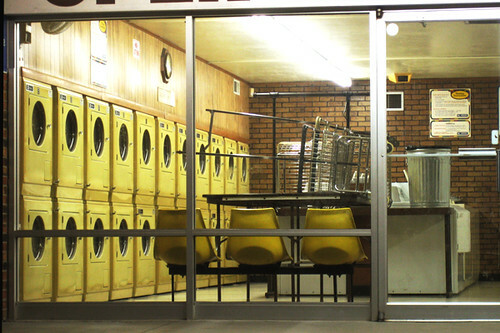 There are washing machines in our building (which we use), and dryers as well, but we found that the dryers didn’t do a great job with our clothes, so to dry our wet laundry, we take it to the laundromat. I know, I know, sounds a bit inefficient (and it surely is), but it’s what we do and it works for us. Thanks to calico_13 for the great picture! I finally/formally introduced myself to the attendant, her name is Maria, and immediately felt much better. Our interactions haven’t changed much since, but I feel better knowing that I’ve at least made a more personal connection. With the holidays approaching a few weeks back, Erica and I thought it might be nice to give Maria a card. Beyond being friendly to us, she doesn’t do anything particularly special for us, we wash and fold our own clothes; however, we thought she might enjoy receiving a small token of appreciation. So we wrote a holiday card to Maria and included a gift card to Dunkin’ Donuts as a quick thank you. This small expense proved to provide more value/enjoyment per dollar than most other purchases I’ve made in quite a while. Maria must not get many holiday cards from customers, because she seemed a bit surprised (and very appreciative) when we gave it to her before Christmas. When we next saw Maria, upon returning to our neighborhood after New Years, and returning to our normal weekend routine of chores, she quickly expressed her gratitude for the card and then asked for my phone number, smiling and saying that she had an idea for a surprise for me and Erica. Her ‘surprise’ was that, as a thank you for our holiday card/gift, and as her own holiday gift to us, she wanted to make us empanadas. I gave her my phone number and we planned a time for me to visit her apartment to pick up the empanadas later in the week. 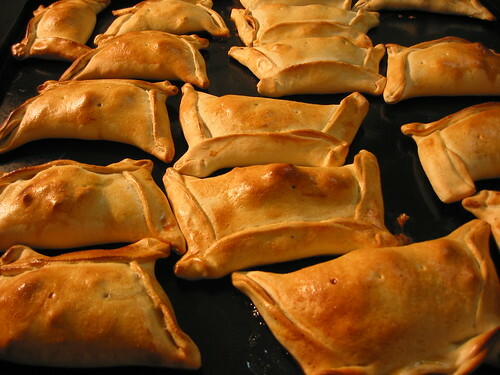 Friday night came, and I received a call from Maria, saying that she had just finished the empanadas…they were still warm and were ready to be picked up! After briefly chatting on the phone, I headed over to her building. She greeted me downstairs and welcomed me to her apartment after a short trip in the elevator. Needless to say that, after an afternoon of making empanadas, her place smelled great! Thanks to mabel flores for the picture! She introduced me to her husband and we all chatted for a bit. She described the empanada recipe (tuna, onions, garlic, etc. ), explained that they’re called pasteles in her native language (Cape Verdean). We talked about her week (it had been her birthday on Tuesday) and I told her a bit more about myself (how Erica and I are getting married this summer, what we do for work). The conversation didn’t last long and I still have a lot to learn about Maria (questions about her/her family, when she came to America), but it was great to chat with her and to make a more personal connection. Maria certainly didn’t have to make me and Erica those pasteles, we certainly weren’t expecting anything in return for our card, but our random act of kindness brought about another…to both of our delights. Your thoughts? Do you have any stories to share about recent random acts of kindness? Did you enjoy this post? If you did, please consider following me on Twitter, subscribing to my RSS Feed or sharing it with your networks using the buttons below. I welcome and look forward to your comments! In addition to my love of writing, I love to cook. Most of the time, I focus on the savory…and leave baking to the professionals like my mother (whose cookies/brownies are second to none). However, on certain occasions (like Christmas), I bake pies. Apple pie is my specialty I suppose and it’s also my favorite to eat. Though I make the filling ‘from scratch,’ I usually rely on a packaged/pre-made crust. While the crust is easy to make (or simply unroll) and is consistently tasty and flaky, like any good pie crust should be…I’ve always envied the ‘from scratch’ crusts that Mim prepares every year at Christmas. Thanks to abyssalmissile for the photo! Note: ‘Mim’ isn’t a ‘Mom’ typo in this blog post. Mim is my grandmother and is short for Mimere, a name which is a nod to her French Canadian roots. Mim makes pie crust the old-fashioned way, from scratch, with little more than flour, water, shortening and salt…and the results are always outstanding! We were fortunate enough to have Mim join us again for Christmas this year, so I took advantage of the time together to observe her in her element, making crusts for our holiday pies, to see what I could learn. Mim doesn’t use a recipe to make her pie crust, she doesn’t need one. Instead, she relies on how the dough looks and feels at any given time in the process. As a relatively novice home cook, I find this to be amazing. I’m a very detail-oriented person who values clear directions, instructions and plans…so for me, working without a recipe is very difficult. How can you ensure a great, consistent result if the process isn’t the same each time? With 75+ years of pie-making experience, Mim doesn’t need a recipe anymore. The process is pretty much second nature at this point, so instead of following a recipe, she makes the crust by look and feel. While the inputs and process might change a bit each time, the quality of the output never does! In fact, I learned that since conditions change (e.g., temperature, humidity, etc. ), if Mim did follow the same recipe each time, the quality of the end product would likely suffer. So what if the dough looks too sticky? Add flour and knead it some more! So what if the dough is too dry? Add some more water! I like the structure that a recipe provides because it enables me to work through a clear set of steps along the way. While I tried to capture a ‘recipe’ for Mim’s pie crust this Christmas, I failed…and she regularly reminded me that a recipe wouldn’t do me any good…because it changes every time! Because I can be a bit impatient from time to time, I want the ability to readily make Mim’s pie crust now…fast forwarding through the small part of the story where 75+ years of practice is required! With that, of all that I learned from Mim that day, the biggest lesson for me was, don’t rush. Don’t just focus on the end result, enjoy the process and recognize that no matter how good the recipe, there are no substitutes for the most important ingredients…patience, practice and love. Thanks Mim for being a living lesson for me this Christmas!